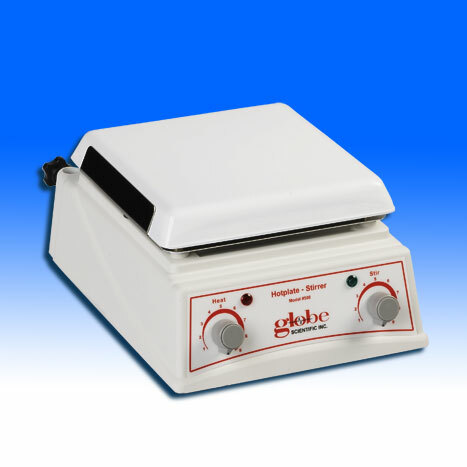 Globe’s hotplate stirrer offers the benefit of having two separate machines in one unit. The small, space-effiicient design (8 x 9 inch footprint), makes it ideal for use on crowded benchtops and inside of bio-hoods. It features an exceptionally durable, chemical resistant white ceramic work surface. The advanced microprocessor controls with convenient turn knobs allow quick, precise adjustment and maintenance of speed and temperature. Safety indicator LED’s on the front panel indicate when the heating and/or stirring functions have been activated. With a square 7.5 inches of work surface, the hotplate stirrer is compatible with a wide variety of glass beakers, flasks, bottles and other vessels. This model comes complete with a support rod for mounting thermometers and temperature probes. Dimensions (WxDxH) 8" x 9" x 4.5"